I juts uploaded v1.1 to itch.io. This update contains the single, most significant, control update ever! 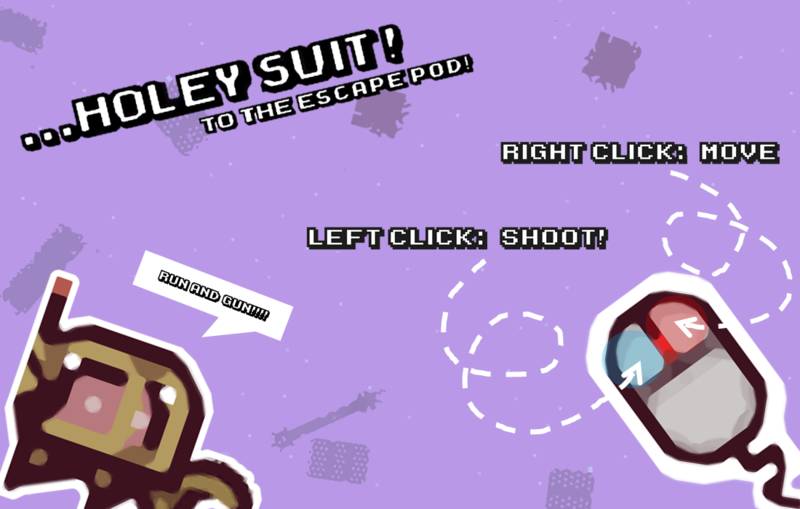 For better or for worse, holey suit now plays... With both mouse buttons!!! Left click: to shoot your weapon - you can now save ammo until you actually want to use it!!! Beware - the recoil will still occur, so beware not to push yourself towards a piece of debris or passing alien! Will this make the game better? No idea! Will people like the controls better? Maybe! Any chance new players might get the hang of the game without getting too frustrated? I hope so! I am sad to see the single button mechanic go, but I just feel the game might just be too hard for its own good. The same physics will apply so it's only a nod helpful though - those up for a challenge still will have that! The game still plays fine with one button for the purists. It's also important it works with one button as I am planning a mobile/tablet port, those tapping on a screen won't have a choice either so it needs to work! Anyways - give it a try, and let me know what you think!! !